Primary Natural Resources corn, cotton, wheat, coffee, peanuts. ZIMBABWE IS a LANDLOCKED country in southern Africa. It is bordered by SOUTH AFRICA, MOZAMBIQUE, BOTSWANA, and ZAMBIA. The name Zimbabwe comes from the Shona words dzimba dza mabwe, or “houses of stone,” a reference to the stone ruins of the kingdoms of Great Zimbabwe. 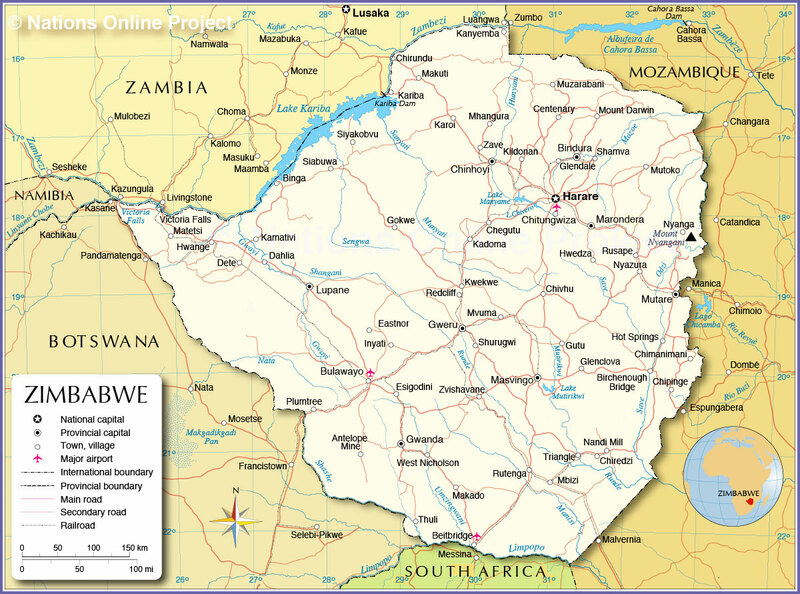 Dating back to the 13th century, Zimbabwe consisted of a series of kingdoms of stone settlements known as zimbabwes. The largest of the kingdoms was the Great Zimbabwe, lying 300 mi (483 km) south of the Zambezi River and 250 mi (402 km) from the INDIAN OCEAN. The kingdoms represent the most extensive and extraordinary group of ruins in Africa. They have been dubbed the greatest stone monuments in Africa, aside from Egypt. Archaeological evidence shows elaborate stone structures that were enclosed by walls about 20 ft (6 m) thick and 35 ft (11 m) high. The evidence also shows that Great Zimbabwe had a well-organized social and political structure, culminating in trading in gold, ivory, copper, and beads. While it is not clear why the Great Zimbabwe collapsed, scholars believe the decline began as a result of European activities, particularly Portuguese’s disruption of the trade networks in southern Africa between the 16th and 19th centuries. The legacy of the Great Zimbabwe can be found among 71 percent of Zimbabweans who speak Shona. Other languages include Ndebele at 16 percent of the population, and the remaining 13 percent is spread among the Tonga, Venda, and Sotho. Unlike many African countries, Zimbabwe (formerly Rhodesia) was never directly colonized by a European power. The origins of Rhodesia lie largely in the vision, ambition, and enterprise of Cecil Rhodes. In 1889, Rhodes successfully petitioned the British government for a Royal Charter for his British South Africa Company (BSA). The British government granted the charter and delegated nearly all administrative responsibility as well as commercial rights in greater Rhodesia to the BSA. In 1924, the BSA administration was dissolved and Southern Rhodesia became a self-governing British Crown colony. Self-government was, in fact, confirmed to the white-settler community, which grew rapidly but was never more than 5 percent of the population. In 1953, the British government consolidated its territories by creating a federation of South Rhodesia (Rhodesia), Northern Rhodesia (Zambia), and Nyasaland (MALAWI). The purpose of the federation was to establish a multiracial region; however, the majority blacks viewed this federation with skepticism and as another attempt by whites to maintain power over a predominantly black Africa. In 1963 the British government conceded to pressure by African nationalists and granted independence to Malawi and Zambia. Rhodesia, however, was denied independence. For some time it felt like there would be a black majority role in South Rhodesia. Blacks built an effective political movement and challenged the dominance of white rule. Sensing the evolving political aspiration of blacks, the minority whites elected the Rhodesia Front (RF) in 1963. The platform of the RF was to uphold white supremacy through any means. The new government used its power and suppressed emerging black nationalist movements such as the Zimbabwe African People’s Union (ZAPU) and Zimbabwe African National Union (ZANU). By 1965, the Rhodesia government under the RF, now led by Ian Smith, felt it could no longer negotiate with Britain for its future status, and by its Unilateral Declaration of Independence (UDI) it refused to bow to outside opinion. In so doing the Rhodesian government brought the wrath of Britain and the world at large upon itself. In 1967 the United Nations imposed mandatory economic sanctions against the RF regime. Unfortunately, the sanctions failed because other countries, particularly the apartheid government in South Africa, continued to trade with Rhodesia. It became apparent that blacks had the burden of removing the RF regime from power. ZAPU and ZANU went underground and began an armed struggle in 1966. With the RF regime’s inability to stop the guerrilla campaign by the ZAPU and ZANU, the government proposed a power-sharing agreement in 1978. However, the agreement concentrated power in the hands of the minority whites, which led to an escalation in the armed struggle. In 1979 a compromise was reached at a meeting in Lancaster House, LONDON. The compromise opened the door for majority black rule in the history of the country. In 1980 Zimbabwe became an independent country, and Robert Mugabe, the leader of ZANU, became the first black prime minister. The black majority inherited an economic, social, and political structure previously built on race. Since the 1980s the Mugabe government has worked to dismantle the economic gap between blacks and whites. These effects have included improving the livelihood of blacks and redistributing land. However, the racial harmony that has existed since independence fell apart in early 2000. Facing a major political challenge from the Movement for Democratic Change (MDC), the Mugabe government encouraged the veterans of the liberation movement to take over white-owned farms. The ensuing takeovers and intimidation propelled Mugabe to a narrow and disputed election victory in 2002. Unfortunately, such upheavals have created severe economic difficulties for all Zimbabweans.